This then brings our grand total to 307 which, as I have said, is completely above and beyond what we expected, so thank you so much! All of our donations have been evenly distributed to collection points supporting The Red Box Project, The Homeless Period Southampton and Trinity Winchester. First and foremost, I would like to thank my friend Nick for taking the time out of his day to help me with these donations, I couldn’t have done it without you. I would also like to massively thank Hayley for her constant and continued support as well as An-Sofie, the marketing team and the rest of SUSU for helping me turn this project around in such short notice! 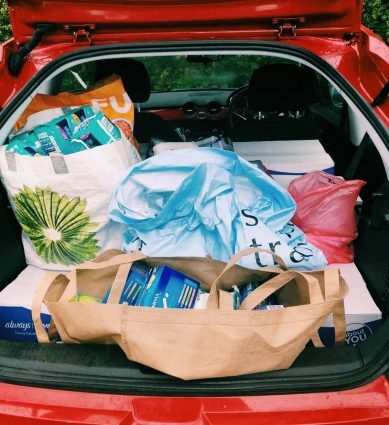 Finally, I would like to thank October Books, Trago Lounge, The Hub – Eastleigh and Trinity Winchester for accepting our donations and ensuring that they reach those who are affected the most by period poverty. Again, I am blown away by the generosity of the donations and I’m so unbelievably thrilled that this was such a success! So many lives are going to be changed by these donations, so thank you. Thank you so much!